SystemPods are designed for mounting multiple pieces of electronics into a single NavPod. A Radar or Chartplotter can easily be mounted along side Autopilot or Instrument displays. The PedestalMount is designed for raising the fish finder off the deck for protection while providing tilt and swivel functionality for conveniently operating and viewing the display. The PedestalMount is for mounting the fish finder near the bow on sportfishing boats. The fish finder's trunnion bracket is to be mounted onto the top bracket of the PedestalMount. The top bracket has predrilled mounting holes that match up to most popular fish finder trunnion bracket mounting holes. The tilt functionality of the trunnion bracket is combined with the swivel feature of the PedestalMount. The added height of the 8" tall PedestalMount makes operating and viewing the display very convenient. The tough and rugged black powder coated aluminum pedestal is 4" in diameter with a 6.5" round base. Connectors and wires that go into the back of the electronics are protected from being stepped on or inadvertently kicked or damaged. All wires and connections are routed internally through the pedestal base for protection. The operating convenience of tilt, swivel and added height combined with the protection for wires surely makes the PedestalMount a great addition to many sportfishing boats. PowerPods are better than bracket mounting. Sturdy and secure, yet clean and attractive, PowerPods position your fishfinder/chartplotter at a 20° viewing angle. PowerPods provide the clean look of flush mounting with the advantages of a swivel base. PowerPods are available in two color options: high gloss white (all models) and black carbon print (PP4400, PP4500, PP4600, PP4800, PP4900, PP5050, PP5100, PP5200, and PP5920 Series only). Constructed out of durable acrylic-capped ABS like all Gen3 NavPods, both color options have the same high gloss finish with UV stability. NavPods are made to protect your marine electronics from the harshest of wet boating conditions. All NavPods are manufactured with a double gasket system that provides an excellent watertight seal. PowerPods keep the spray off the electrical connections on the back of your fishfinder/chartplotter, assuring reliability and longevity of your marine electronics. Your fishfinder/charplotter is easily mounted into the pre-cut face of the PowerPod. The base of larger PowerPods (PP4800, PP4900, PP5030, PP5050, PP5060, PP5100, PP5200, and PP5920 Series) has a 1.8" opening. The base on smaller PowerPods (PP4100, PP4400, PP4500, and PP4600 Series) has a 1.1" opening. This provides plenty of room for running wires and connectors through the base to conceal them from the elements. This provides protection for wires and connectors from water intrusion, UV exposure or damage from getting snagged or ripped out of their sockets. All NavPods come with a security wrench and nickel chrome-plated stainless steel tamper-resistant screws for protection from theft. PowerPod pre-cut models are available for 7" through 16" displays from all major marine electronics manufacturers. 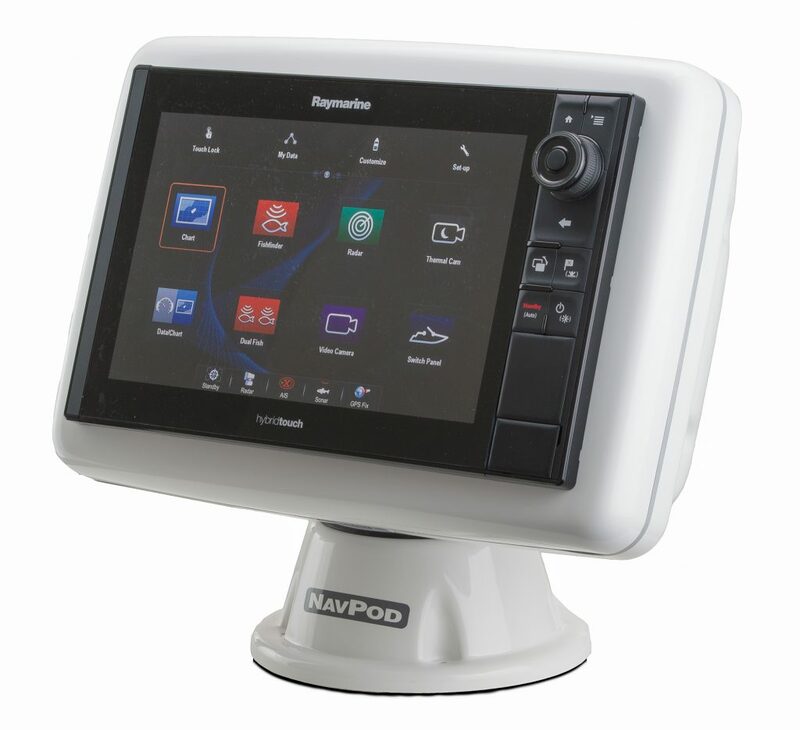 NavPod backs up their commitment to quality by offering a 10-year warranty on all Gen3 NavPods. PowerPods: Protection, Convenience, Security. PowerPod with RAM Mounts combines the good looks and waterproof protection of a NavPod with the mounting flexibility of RAM Mounts. PowerPods are manufactured with a double gasket system that provides an excellent watertight seal protecting your fishfinder or chartplotter from the harshest of wet boating conditions. 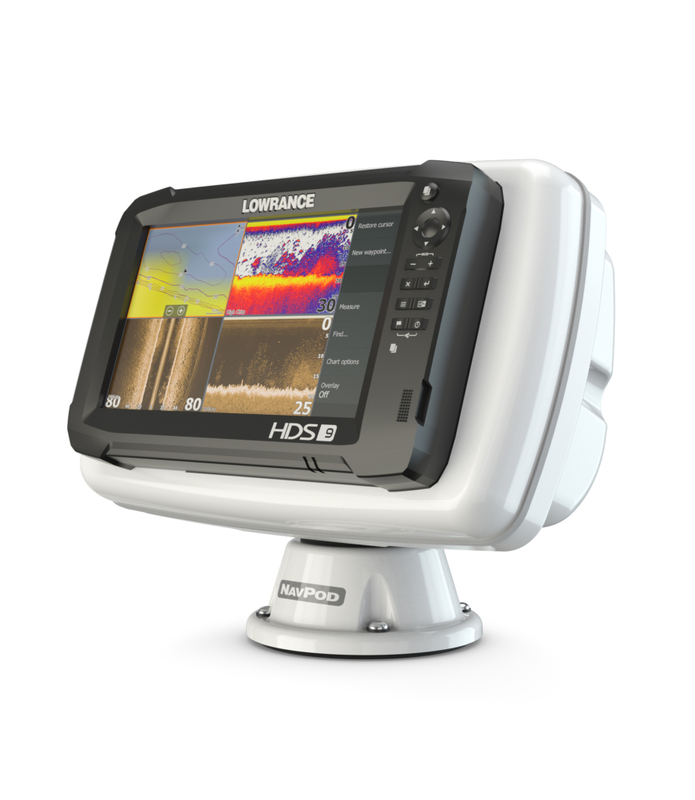 Protection assures reliability and longevity of your marine electronics. The proven RAM mounting system that is part of the PowerPod RAM Series uses the large 2.25” rubber “D” size ball, two cable manager base platforms, RAM-D-201U-C arm and the Pin-Lock security knob. The Hi-Torq wrench is also included. 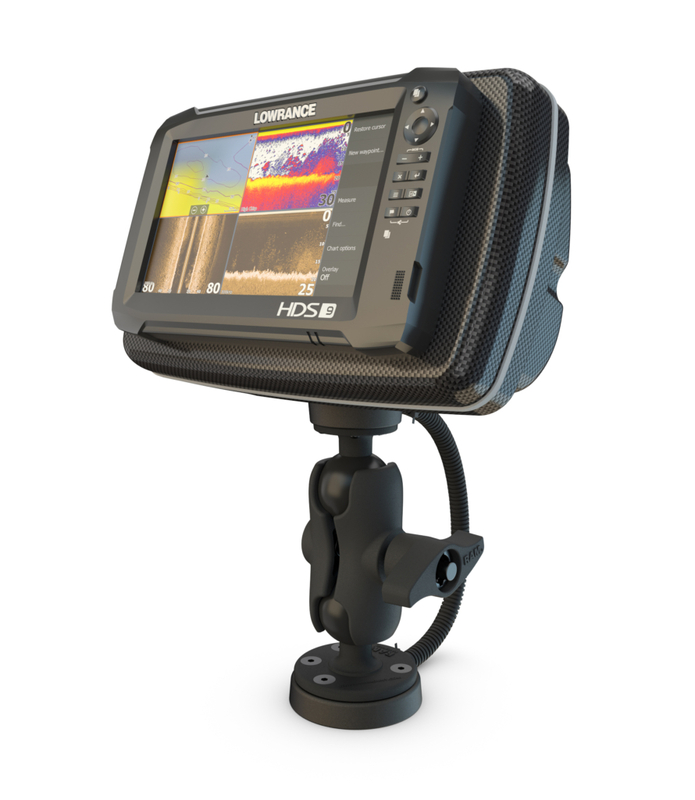 RAM Mounts are designed with a patented rubber ball and socket system that allows an almost infinite number of ways to position the angle of your fishfinder or chartplotter for an adjustable and precise position for viewing. NavPods unique stainless steel tamperproof fasteners and the RAM Pin-Lock security system are combined to allow you to leave electronics on board the boat without worry. Mount it on any surface angle and protect your electronics on all sides. The PowerPod RAM Series combines the best attributes of two very popular product lines from two very focused companies providing mounting solutions for your marine electronics. Stanchion Kits are a very strong, sturdy and secure way to mount electronics on the dash or in the overhead area. All Stanchion Kits include two mirror polished 316 grade stainless steel tubes with 1.25" outer diameter and 0.065" wall thickness. Kits also include stainless steel feet and mounting hardware. The stanchion tubes are pre-drilled for easy installation of a compatible NavPod. Wires can be routed down both tubes and are all concealed for a very clean installation. First, find the right SailPod or SystemPod for your electronics, then choose the corresponding Stanchion Kit. Some Stanchion Kits are designed specifically for dash mounting (SK11, SK135) and some are designed specifically for overhead mounting (SK125, SK129, SK130). Each Stanchion Kit is designed to fit a specific range of NavPod sizes. 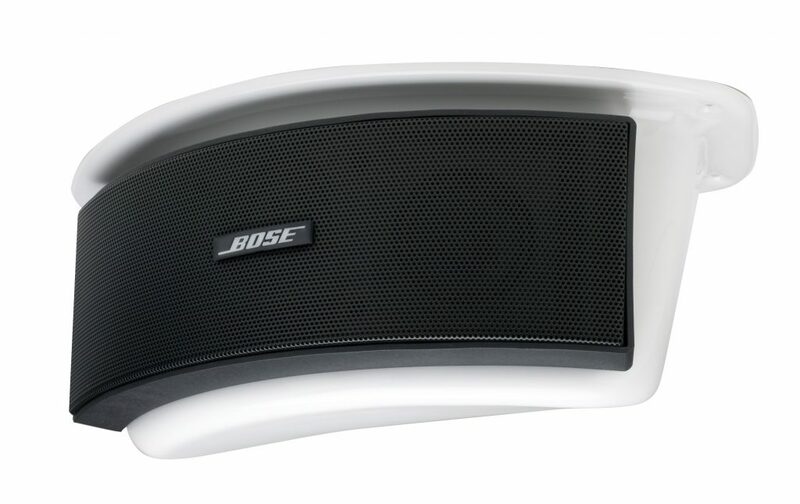 SpeakerPods are designed for surface mounting your Bose 151 speakers under sternrail seats. Tamperproof Wrench Set fits all NavPod generations and includes a set of three wrenches.